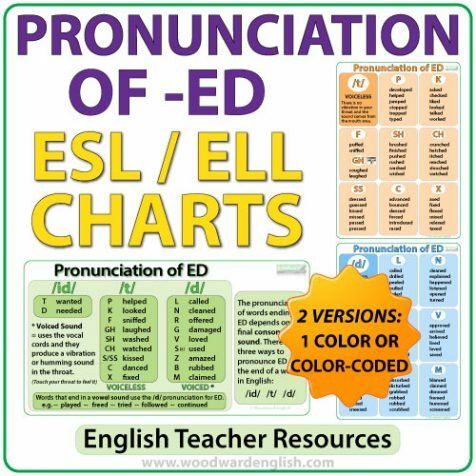 ESL / ELL Reference Charts about the pronunciation of ED in English. Why does the ending of helped sound like a T, the end of opened sound like a D, and the end of wanted is a whole new syllable with a sound like ID? Our charts explains the general rules for the pronunciation of words ending in –ED. 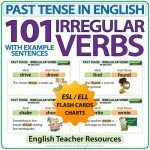 These words are normally regular verbs in the past tense but these rules can also be applied to adjectives and past participles that end in -ED. 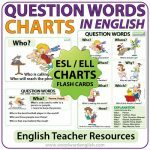 This resource is ideal for teenage or adult ESL/ELL students to help them sound more like a native speaker. It is a great reference guide to help accent modification. 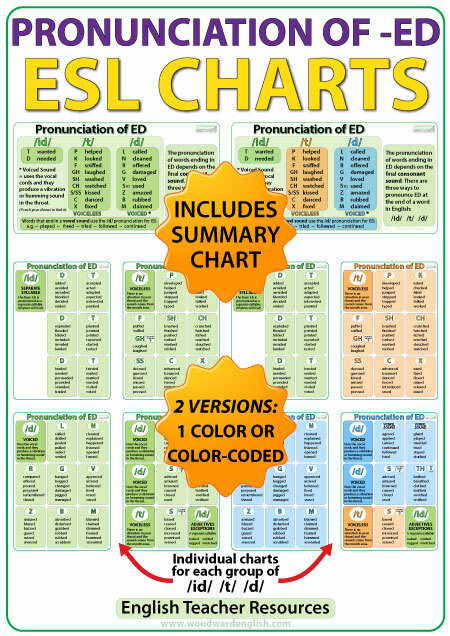 The first chart is a summary of how to pronounce -ED showing /t/, /d/, or /id/ endings with examples. Then we have a smaller version of this same chart with two of them on one page (surrounded by cutting lines). This chart contains examples of words that end with the voiceless /t/ pronunciation. There is a box for each letter (P, K, F & GH, SH, CH, SS, C, X) and six examples of that letter (e.g. for P are the words developed, helped, jumped, stopped, trapped, and typed). The letter F and GH are in the same box with two examples for each. This chart contains examples of words that end with the voiced /d/ pronunciation. There is a box for each letter (L, N, R, G, V, Z, B, M) and six examples for each letter. 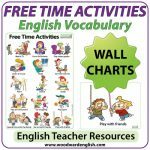 This chart contains examples of words that end with the voiced /id/ pronunciation. 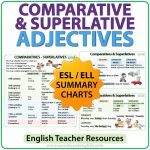 There are 18 examples of verbs that end D and 18 examples of verbs that end in T.
VOWEL SOUND: There are 12 examples of verbs that end in a vowel sound that have the voiced /d/ pronunciation at the end (e.g. agreed, followed, etc.). TH: We give 6 examples of verbs that end in TH or THE and how the final ED has a voiced /d/ pronunciation. EXCEPTIONS: There is also mention of an exception regarding adjectives where the final -ED is pronounced as a separate syllable (e.g. naked, wicked). There are two versions of these charts, one that is designed in one color (green) and the other is with color-coding of /id/ in green, /t/ in orange, and /d/ in blue. Check the preview to see this difference. I have also created a pronunciation video on YouTube about this topic: ED pronunciation in English – How to pronounce ED endings (Suitable for the classroom). Afiches para aprender la pronunciación de palabras que terminan con ED en inglés.